I will urinate wherever I want! I doubt I'm revealing any sort of trade secret if I tell you that the marketing campaign for the latest round of releases from budget martial arts DVD label 55th Chamber was built around the suggestion that the discs would be best enjoyed for their nostalgia value on an old TV with a few beers. I've resisted the temptation to ponder how drunk you'd have to be to find the print quality on a couple of them acceptable, but with Kung Fu Wonder Child I believe I've discovered the inspiration for that particular sell. If ever there was a martial arts drinking movie, then this is it. Little time is wasted setting up the characters and story, and the plot kicks off about ten seconds after the cheesy opening credits have concluded. An ageing martial arts master and his granddaughter are attacked by an evil sorcerer, who captures their souls to use for who knows what. Meanwhile, the masters of a local monastery of magic are having problems with their two dumbest pupils, Mifu and Tudo, who are friends with the cook Wa Wan and his grandson Shu-Chen. 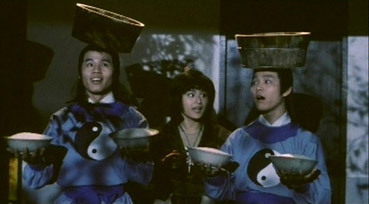 Unbeknown to the Masters, both Wan and Shu-Chen have developed considerable skills of their own, which they use to make trouble for the bullying Chen Kan and to help Chu-Shi, the granddaughter of the old guy who was offed at the start in her quest to uncover what has happened to her relatives. If you come to the film with no foreknowledge of its content or style, as I did, then the first five minutes or so will leave you wondering just what the hell you are watching. The initial mix of kung-fu, fantasy and acrobatics will be familiar to any genre fan, but having resurrected a corpse and regenerated it as a warrior guardian for his graveyard experiment centre, the sorcerer would no doubt be surprised to see his undead recruit hopping home like a zombie rabbit to check on his children, then getting knocked down and walked over by a woman he fails to attack. Saddled as this print is with a particularly silly English dub, you can't help wondering if the humour is actually intentional or a by-product of misjudged sincerity. When a brisk battle lands the zombie face-down in a pile of the world's stickiest manure, you probably have your answer. 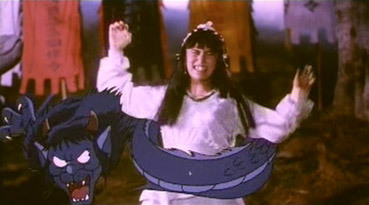 Even back in 1989, fantasy kung-fu was far from new (6 years had passed since Tsui Hark's Zu Warriors of the Magic Mountain), nor was the martial arts horror comedy (Sammo Hung remains king of the hill here for his 1980 Encounters of the Spooky Kind), and Kung Fu Wonderchild is not in the class of either of these two rightly revered movies. Wildly uneven in style and quality, at its worst it's a downright puerile stuff, all bare-arse and urination gags, wide-eyed mugging and 'wa-wa-wa-waaaah' soundtrack mockery. But when it clicks it does so with engaging and energetic gusto. The fights are furiously choreographed, with kinetic wire work hurling the victims of kicks a good twenty feet through the air and bouncing them violently off trees, walls and carts. Footage is slowed down to accentuate fancy moves and the next second speeded up as if the Keystone Cops were having a kung-fu bundle. Cheap and cheerful optical effects and daft noises abound, as magic is hurled about with a furious waggling of hands and spells are cast by pouring wine for the Gods and doing a back flip. At the climax director Lee throws all caution to the wind and turns his villain into a cel-drawn animated dragon and arms his good guys with antique rocket launchers that appear from nowhere, including a multi-barrel affair that bears a striking resemblance to Reggie's gun in Phantasm II. By this point it's hard not to have warmed to the film's exuberant charm and its brazen disregard for any real continuity of style, cheerfully hopping from horror to action to martial arts to fantasy to slapstick to Carry-On smuttiness, at times even stitching them merrily all together into a single lunatic sequence. When it doesn't work you really do groan, but for the most part it's great fun, executed with a deft mixture of energy, imagination and outright silliness. Non-anamorphic 16:9, a fair few dust spots and some sudden, mid-scene changes of colour saturation and contrast levels – yep, this is a 55th Chamber disc all right. But hang on a minute, in other respects this is not that bad a transfer at all, with a decent level of detail, and contrast levels and colour, though inconsistent, often very good. All in all, this is 55th Chamber's best transfer yet. Sound is mono 2.0 and a little fluffy, with minor distortion on louder sounds. As ever only an English dub is available, and it does tend to add to the comedy value, not least in the choice of voices, with old Wa Wan sounding like a fresh-faced 18-year-old and the androgynous Shu-Chen voiced by what sounds like a camp female impersonator. The usual stuff here, with the home-made Kung Fu Wonder Child promotional Trailer (1:20), the Image Gallery (0:57) and promos for other 55th Chamber releases. Yes it's silly, yes it's painfully unfunny in places, and yes characters drop out of the story with no explanation, but in all other respects this is damned good fun, an unashamedly daft genre jape with fine fights and a bucketful of cheek. For once I'm prepared to recommend the DVD – the transfer is pretty good, and at £6 you can't really go wrong.